Video production is now booming from YouTubers to Filmmakers and vines. With the release of several video editing software, it has become a lot easier to produce high-quality videos with special effects. With hundreds of options out there for professionals, prosumer and basic, alike, what video editor is the best choice? Considering the features, compatibility, and price? In 2017, it’s now much more accessible for any skill-level user to create a professional looking video at an affordable cost. Before writing this post, I have done hours of research to find the good software that is suitable for a particular target audience, and it has 3 categories. So that later, based on your needs and requirements you can make a right decision to choose a good video editor. Professional: These Softwares are used for full-length Hollywood movies, paid commercials, short films, and YouTube channels. Prosumer: It is mainly used for private use and has some advanced features to add special effects to videos. Most of the editors from this category are free to use. Basic: You can only use it for trimming a film, creating slideshows from photos. I have included video editors targeting these three categories so that everyone can get a video editor for their needs. Video editors are no longer just a source to simply edit videos with slicing tools; PowerDirector 15 boasts an extensive range of editing tools as well as a complete multimedia solution, end-to-end. 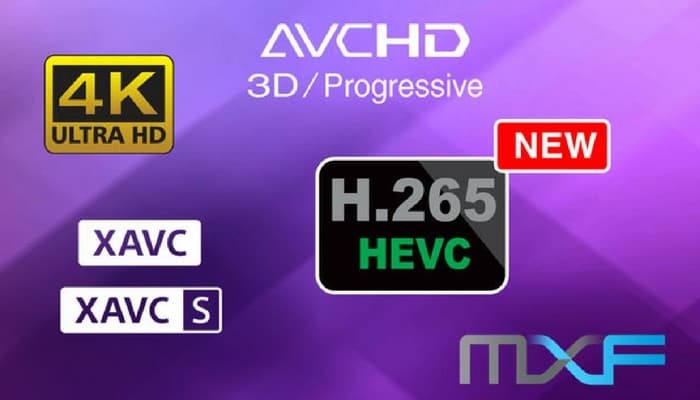 The software presents many features and brags the ability to access new HD formats including 4K HD, H.265, XAVC-s, 3D, DTS audio and Blu-ray discs. The 360-degree video is very similar to panoramic photos, however, in video format. A view in every direction can be recorded at the same time and is therefore very popular. 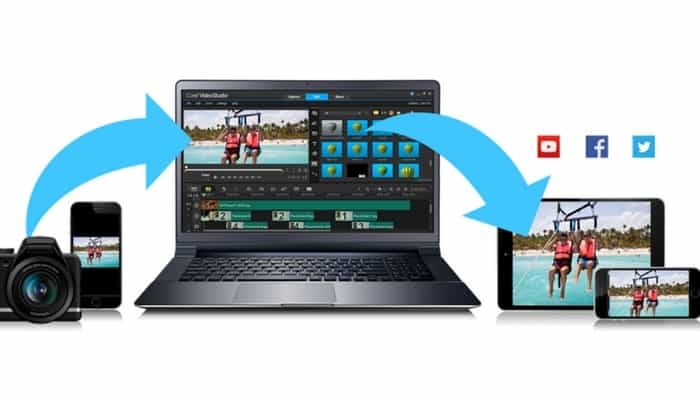 PowerDirector supports 360-degree video editing, allowing you to select specific sequences of clips from the 360 footage, and compiling it into a standard video project. Some limitations of 360 footage mean you can experience some distorted views throughout the video. However, PowerDirector’s comprehensive tools have special filters built in, and so you can quickly correct any problems. Amending aspect ratios is often considered a rather tedious task for most video editors. PowerDirector offers a simple yet effective solution for implementing a 9:6 aspect ratio, useful for mobile phone videos. You can switch from 4:3 to 16:9 or 9:16 with a simple button on the interface, eliminating the need to dig into project settings. Combine this with PowerDirector’s smart technology that can analyze footage, as and when, to enhance video quality, color, and image correction, with a simple slider arrangement. CyberLink PowerDirector 15 is great all-around software; it focuses on the user, comprising a comprehensive video editor, from basic video creation to excellent special effects. This software will continue to serve you in the present and the future. 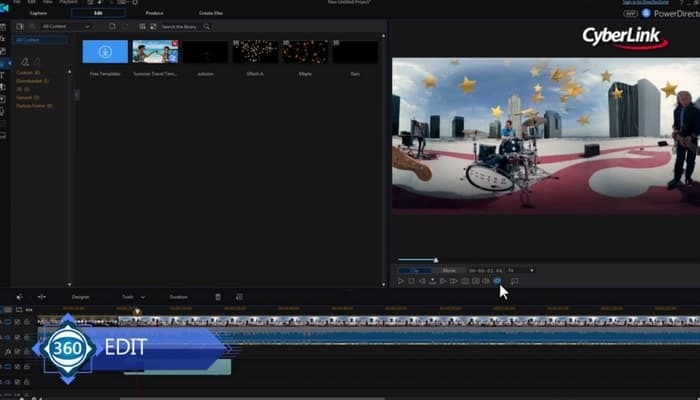 Available for Windows and Mac, Adobe Premiere Pro CC boasts true professionalism, building software for its users based on customer feedback, with this non-linear video editor. Adobe Premiere Pro CC has earned the title for ‘industry standard,’ giving you a real feel for what it offers. Whether you’re a video blog user, creating a music video, or developing a full-length movie, Adobe offers you great versatility, with all the tools and features that you’ll need. A major problem for some video editing software is the format of your video import. Adobe makes importing media very simple, whether it’s straight from your computer, camera, or mobile device, Adobe provides comprehensive support for almost any media capturer. Once your video has been imported, there are some fantastic features on offer, such as integration with After Effects and Photoshop, giving expert users a lot of versatility. For professionals, it can be very time consuming when synchronizing audio and video clips which have been recorded separately. Lining the clips up exactly and eyeballing the correct placement can seem like a menial task, but it can be very frustrating. An excellent feature of Adobe Premiere Pro CC is that it synchronizes for you, automatically. 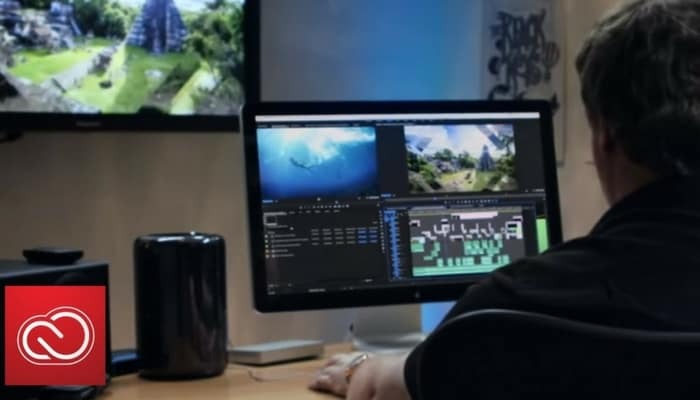 Adobe remains top of their game with Adobe Premiere Pro CC, offering an intuitive and user-friendly video editing software suite. Throughout its lifecycle of products, Adobe listens to their users and update accordingly, making it a brilliant choice for professional video editing. 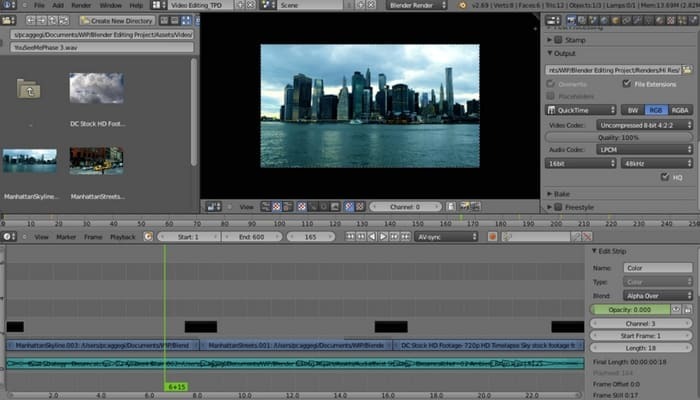 Slightly different to most video editors, Blender is mostly known for its animation capabilities, but also includes a non-linear video editing system. Blender offers an outstandingly powerful suite for the creation of 3D modeling and animation and has been used in the past for some pretty big names, including, History Channel, Red Dwarf, and demonstration videos for NASA. Putting the animation features aside, Blender offers a complete video editor, too. As with all video editors, timelines are present for clips to be placed and moved across the timeline, overlapped, and edited, with an extensive library of effects and transitions. Because of its nature, Blender comprises of advanced features including 2D and 3D motion tracking with animated objects, and camera correction tools to ensure final professional projects. Blender is an open source project, so learning modules and training guides aren’t always located where you think they’d be. However, there is a very healthy community, including forums that are regularly updated. Should you feel that you are stuck for answers, you are more than likely able to find the answer within the community without too much hardship. With the animation and video editing software, Blender is an excellent package for users with varying skill levels; it’s easy to use and offers the right tools for a fantastic finished project. Considering its use in the commercial world, and the extensive features that come with the software, users would expect to pay a decent sum of money for Blender. The cherry on top is that Blender is completely free! Would you believe it? Final Cut Pro X is professional video editing software from Apple. Specially designed for prosumers looking ahead of iMovie towards creating high-quality content for Movies and TV. It wasn’t the most anticipated video editor until the most recent revolutionary update. As usual, Apple came up with a unique idea of the Touch Bar integration in Macbook Pro. Touch Bar brings us endless possibilities to use Final Cut Pro X with extraordinary speed and precision control. Although you don’t have a touch bar on a Mac Pro, what you have is still worth to read ahead. Apart from some of the known and obvious industry leading features, we have a wide array of features that are unique only to Final Cut Pro X. Like the Magnetic Timeline 2, that can automate video clip gaps with insane perfection. It can even work on audio adjustments to avoid sync problems. 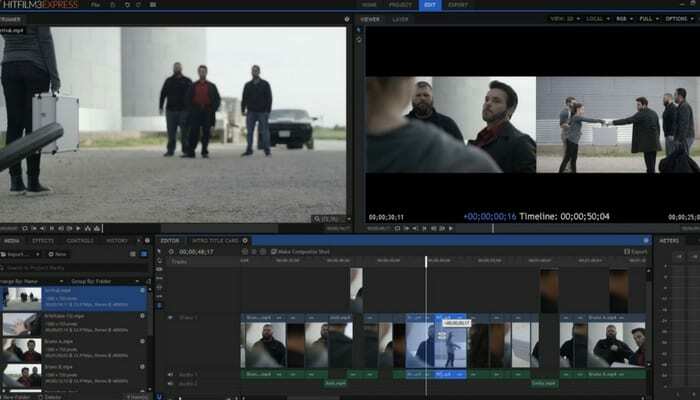 You won’t have any more clip collisions with Magnetic Timeline’s intelligent engine. You can even keep as many video and audio files placed on the timeline. That can be intuitively edited just with a few clicks. And if you’ve assigned a keyword to a clip, it get’s even better to instantly add related videos with a click. Apple has made it even more personal and customized so that you can edit videos creatively without caring much about how this thing works. And that’s when we heard from professionals that Final Cut Pro X is easier to use as compared to Final Cut Pro. Although we don’t have collaborative editing mode yet and there is no official support for 360-degree VR content. Some might even be worried to export Final Cut Pro projects. But like I said before, there has to be Pros and Cons considering a wider market. Otherwise, there’s everything inside for professionals, from special effects to motion templates or gigantic libraries full of editing goodies. With an overall friendly and customizable workspace to Apple’s secret editing companion. You don’t even need to worry about supported formats or the time required to render. Those concerns are all history today because Apple’s focus shifted to deliver what exactly it’s loyal consumers need. Just like Adobe Premiere Pro, this is truly the second choice for very professional editors. Vegas Pro was originally published by Sonic Foundry, but later Sony acquired and reinvented according to customer feedback. Today, Magix proudly owns this non-linear video editing masterpiece. There have been very dynamic improvements over time, and some features are still very unique. It’s only targeted for professional users to create high-end Hollywood class movies and exceptionally perfect videos. Some examples of the recent features include Hover scrub technology, where you can hover over the timeline to instantly view a thumbnail. Or the most anticipated 4K upscaling promises breathtaking UHD quality. The addition of Red camera support enables to accept importing videos from nearly any digital camera. There’s even so much more to discuss like up to 40x velocity for extreme motion effects, smart zoom delivers the DSLR fade effect within a video. And all this is happening quietly neatly with next level editing options. You don’t have to be worried about the hundreds of core video formats because it can even play around HFR, ProRes, and even HEVC quickly. And You are gonna fall in love with the special effects library that isn’t available anywhere else. From all in one 2D video editing tools to the most demanding 3D and even 360 ones, Vegas Pro does it all hassle free. We are talking about Blu-ray level content with Dolby Atoms sound quality. You will need a Windows PC with a powerful GPU to unleash the full potential of Vegas Pro. It can save you hours of manual editing time and intelligently renders with the robust speed with accuracy. All this is packed in Vegas Pro 14 amounting to a one-time payment of $599. Good news is that a basic version, the Vegas Pro Edit can be obtained at $399. And if you want something beyond it, the full-fledged Vegas Pro Suite totals $799 with everything you ever wanted. Established in 2011, HitFilm offers an entirely free video editor, with many of the same features that its big brother HitFilm 3 Pro includes. HitFilm Express 3 has a wonderfully clean interface, making it easy to understand and use from the offset. If any aspect of the process doesn’t make sense, there are many helpful tutorial videos available via their website. Although it may be considered the ‘standard’ version of the series, HitFilm Express 3 comes complete with a library of special effects, including 2D and 3D composition, automatic motion tracking, and green screen removal options. For those looking for an affordable video editor, with the ability to create professional looking videos, HitFilm Express 3 gives you the ability to create and add virtual lighting. Taken from the original lighting in the video, users have the option to add more shadow depth and motion blur to give the atmosphere they desire. The technology behind the software enables these effects post production, for an expert final project. If you’re looking to work with 4K, however, this option will only be available if you upgrade to the Pro edition. Saying that the HitFilm website allows you to add ‘bolt-ons’ to your Express 3 version, for a small fee, meaning you can upgrade your free software over time, selecting the features you want and need for your projects. An example of this would be the Sci-Fi pack where you can add light sabers and other fun effects to your videos! Alternatively, if you’re looking for something more professional, you can get your hands on lens flare, lighting, and classic film stock packs. Considering HitFilm Express 3 is a free software package, you really can’t go wrong with the options that are on offer. The video editor allows you to tailor your software to your end project goals; an easy to use program with a healthy library of effects and transitions, for free. Corel VideoStudio is a great piece of software for everyone; it’s simple to use, allowing unskilled editors to create breath-taking videos in a matter of minutes, easy to pick up but doesn’t withhold the tools and utilities that experienced users rely on. Corel VideoStudio offers 32 editing tracks, ranging from video, overlays, titles, voice, and audio. Although the range of editing tracks is extensive, only one single video editing track is visible, which could be a little frustrating for more complex projects. The software itself provides a wide library of effects and transitions, with more than 200 options to choose from. This allows beginners to choose a variety of effects, and experienced users, without having to create these manually. A useful original feature of the software is the Instant Project tab; this provides the user with a collection of templates to get them started with a project. The concept is easy to use and allows a simple drag and drop process to create a great video in a very short amount of time. As with most modern video editing software, Corel VideoStudio allows you to export your video in 11 popular file formats, including, MP4, MOV, and AVI. The export process links up with popular social media platforms like Facebook, YouTube, and Vimeo, and doesn’t require the user to exit the program. Corel VideoStudio is an excellent choice for varying skill levels of video editor. There are many training and learning options within the software, allowing beginners to get to grips with video editing before jumping straight in. For experienced users, there are many features, editing options, and effects/transitions to choose from, in a user-friendly and accessible environment. 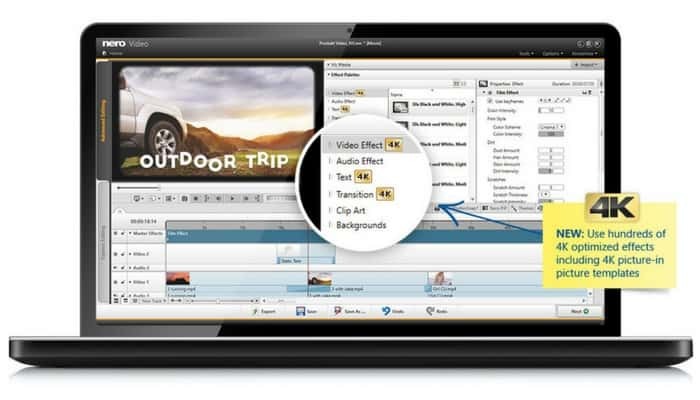 Pinnacle Studio is a 64 bit Windows video editing software suitable for robust video editing. It offers many features, including, drag and drop HD video, timeline-based editing, DVD authoring, title and overlay creation, the addition of sounds/music, and transitions and effects. Pinnacle Studio 20 offers 3 different packages; standard, plus, and ultimate. With the base level of Pinnacle Studio, you’ll have access to 6 editing tracks; one for video, sound, music, title, and overlay. This package would certainly be suitable for small projects. However, you may wish to opt for the other versions if you’re looking for more editing ability. The software boasts over 1200 transitions and effects, which is one of the largest libraries compared to other video editing software. Although basic users may find this intimidating. Pinnacle Studio offers a sample movie to show you how the projects will look and how the interface works. Available input formats consist of: AVI, MVC, QuickTime, MKV, HDV, etc. with the following supported output formats: DVD, MPEG-4, MP4, QuickTime, MKV and some device-based platforms. This makes exporting videos very simple and allows you to connect directly with the likes of YouTube and Facebook, through the software itself, so you won’t have to exit the program. A brilliant beginners package, Serif MoviePlus, offers a straightforward and clean interface with a plethora of training materials to get beginners up to speed while supplying more advanced users with enough tools to complete their complex projects. If you’re a novice user and want to get a feel for how to create a movie, you can use Serif’s QuickMovie tool which will launch a video editor wizard, guiding you through, each step of the way, to create themes, import files, and add personal touches to your final movie project. Once a user feels comfortable with video editing, they can move onto more advanced tools, including the audio mixer and video stabilizer, with over 100 editing tracks. Advanced users can enjoy an extensive library of over 300 video effects and transitions, with two modes for editing; storyboard and timeline. Storyboard offers a good option for beginners to get started with something simple, whereas timeline offers more sophisticated features and unlimited tracks. Once you’ve finished with your project, the simple disc authoring feature provides you the option to add animated menus with the use of templates, or you can create your own. MoviePlus videos can be exported in popular formats, such as MP4, AVI, MOV, and WMV, giving you the option to burn straight to DVD or Blu-ray or upload to your favorite social media platforms like Facebook and YouTube. Serif MoviePlus X6 is a simple training ground for users to learn the ins and outs of video editing, preparing you for more advanced video editing later down the line. It offers a good selection of editing tools and effects for beginners and more experienced users, alike, to create complex projects and professional looking videos. Although it doesn’t offer as many advanced features as other video editing software, Serif offers a mid-range product for novices to consider. Suited to casual or novice video editors, AVS Video Editor offers programs that walk the user through various different prompts and learning guides for each module of the software. There are further guides that link you to the AVS website, allowing beginners to use the software more efficiently. The learning program provides a step by step guide for each aspect of the video creation and editing process, including adding transitions, effects, text, and audio. The beauty of AVS Video Editor is that you can learn while editing, quickly switching between screens. AVS Video Editor offers a wide range of 100 video editing tracks, and over 650 effects and transitions, making for considerable experimentation through the video editing process. There are many options to enhance your video, giving it a professional look and feel, with the addition of titles, credits, and text. Once you’ve experimented with your video creation and editing, users have four options to export their video, in 10 popular file formats, such as AVI, MOV, and MP4. Another great addition, really a staple requirement for most video editors, is that you can create DVD and Blu-ray discs from your video, including menus, giving an ultra-professional feel to your end project. 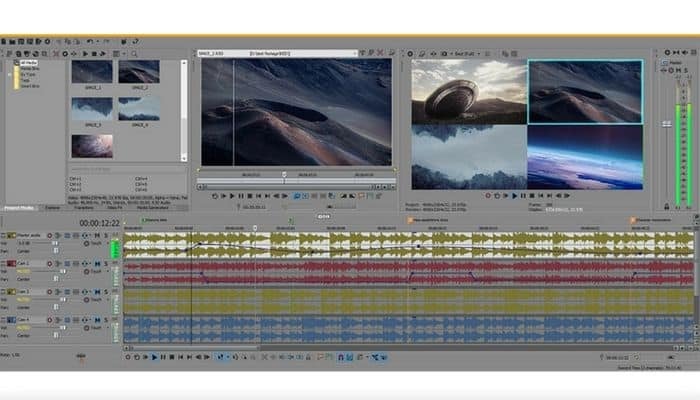 With 72 optimization options, AVS Video Editor would be hard to beat when it comes to optimizing your video for smartphones, tablets, and gaming devices. Unfortunately, when looking at the final exported project, experts have noted some definitive pixelation issues; these issues can be resolved by ensuring the quality is reviewed before publishing and may need several exports before the final work is complete. All in all, AVS Video Editor is a brilliant software option for beginners and novices, with a plethora of learning modules and effects/transitions, to truly experiment when creating and editing a professional looking video. Nero video editing software has been around for many years, as continues to challenge other video editing software within the market. Nero Video 2017 is ideal for more experienced users, due to its counterintuitive interface. Although support is available through Nero’s knowledge base and FAQ’s. It does not offer the range of learning modules that other video editing software might offer. If you do require any technical support, Nero charges $1.29 per minute, which is off-putting for users, such as beginners, who aren’t so familiar with the software. That said, Nero Video 2017 offers two editing modules; express and advanced, allowing you to switch between the two modes with ease between storyboard (express) and timeline (advanced) editing. If you’re an advanced mode user, you will have access to unlimited editing tracks, allowing you to create some really complex and professional projects. With a robust library of over 400 effects and transitions, you’ll be able to create your perfect project through experimentation and professionalism. The layout of the interface, however, can be pretty confusing, especially for those that are used to ‘standard’ video editing software. Once your project is complete, you can export your video in 12 popular file formats, such as AVI, MP4, and WMV. Like many other video editors, you can upload your videos directly to social media platforms, such as YouTube. You can transfer your final project onto DVD or Blu-ray, giving your project that top-notch feel. Contrary to most other video editing software, Nero Video 2017 doesn’t allow you to optimize your video for specific devices like smartphones and tablets, which is a real shame in the modern day editing space. Nero Video 2017 is a solid choice for experienced video editor or users who have edited with Nero in the past. There are many tools to create great professional videos with an extensive library of effects and transitions. However, it falls down slightly in comparison to other video editing software, losing its place from great to good. Camtasia Studio has well earned nearly 12 years of innovative reputation by professional video editors across the globe. The combination of a powerful screen recorder and a versatile video editor is why it’s widely used. Most of your favorite YouTube channels might be using Camtasia as an all-in-one tool. It’s rightly capable of creating trending YouTube videos, educational presentations, sales and marketing projects, etc. You can’t only create high-quality 4K videos but instantly publish them to your channel. And what’s better than an integration option with a variety of third-party software like PowerPoint, Outlook, etc. The unlimited screen capture of nearly any Windows or Mac application takes it apart from the lineup. Where importing, and exporting projects is as easy as a drag and drop. The minimally designed interface is ideal for a beginner to master video editing within a week or two. Adding annotations, transitions and even applying motion graphics is no more a pro thing using Camtasia Studio. You can even mix up screen and webcam captures altogether. And add a great variety of unique audio and visual animations with a few clicks. So, if you are looking for a very decent and easy to use lengthy videos editing solution, that can capture nearly anything directly and some interactive tools to professionalize them. 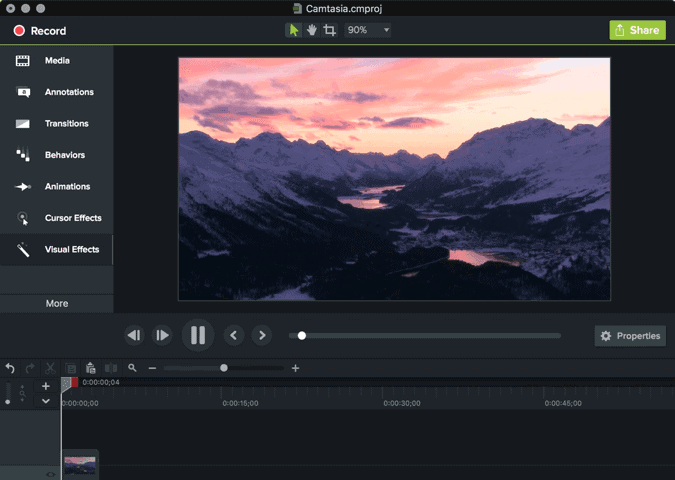 Camtasia Studio promises to “Create awesome videos in hours, not days.” Although we have a free version with basic features to try out Camtasia Studio. But the full version can cost a bit more than your expectation of $199. It surely is worth every penny, as you can use it on a PC and Mac simultaneously. And TechSmith offers free software upgrades until a major update is out. 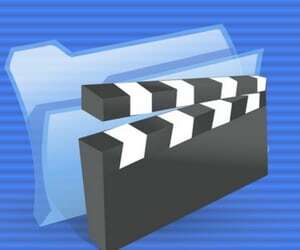 As the name suggests, Windows Movie Maker is available for Windows users for basic editing and video creation. If you’re looking to get started in the video editing space, or want to create/edit amateur movies quickly, then Windows Movie Maker is a sound choice. Windows Movie Maker offers a simple version of a standard video editor, presenting a timeline with clips, displaying audio waveforms. It’s easy to use interface allows you to trim and split clips, stop and start playback, and step back/forward frames. There are a number of effects and transitions to choose from, enabling you to automatically preview them individually with a simple hover of the users’ mouse. Once your video has been imported, you can choose from seven different themes to apply to your video, in addition to title screens, transitions, and credits. You can then edit your video by splitting and trimming clips, which easily snap into view if desired. Although Windows Movie Maker doesn’t offer extensive effects, transitions, and editing modules compared to other competitors. 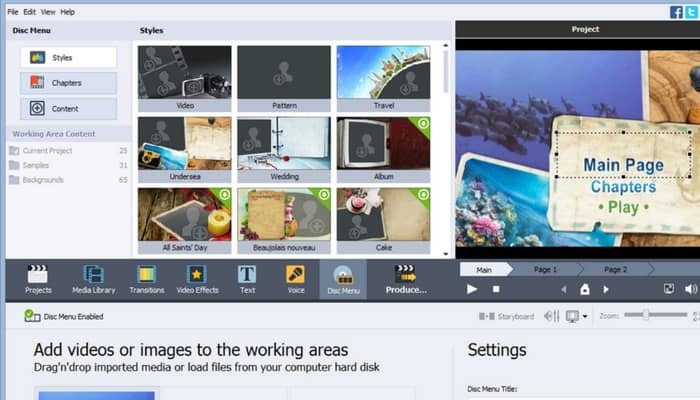 But it supplies an easy and quick way to create and edit videos for those after something simple, or just getting started, topped off by being able to download the software completely free. Ranging from high-end prices, to free software, users have so many options when it comes to video editing software. After reviewing each software individually, CyberLink PowerDirector 15 pips the top spot in this comparison. PowerDirector offers an affordable package at $49.99 while providing some features we haven’t seen in other video editing software; 360-degree video editing, and an excellent adaptation to aspect ratios, to name a few. Adobe Premiere Pro CC is a very close runner-up. Offering a great community, and a company that actually listen to their users, with lots of features and regular updates. It just missed out on it’s higher subscription-based price tag at $19.99/mo. Third place goes to Blender; a no brainer really. Although this software may not be the first that comes to mind for video editing. But once you get under the skin, you’ll realize it’s superior capabilities, including animation projects. Animators and video editors have access to a wide range of features, effects, and transitions, including 2D and 3D motion tracking. Finally, it is totally free. 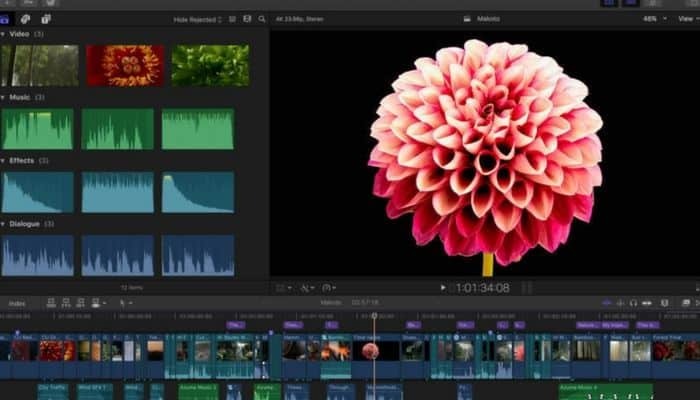 If you’re a Mac user, then Final Cut Pro is a good choice and don’t forget to have a look at the Sony Vegas Pro 14 which is a complete package for high-end professional content creators. It all really comes down to your skill level, and what you’re looking for in a video editor, however, we have tried to compile a list of the best video editing software, taking into account price, features, and options for all.